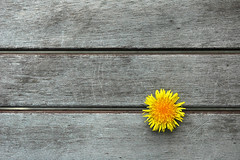 Composition in photography refers to the arrangement of elements in an image. Those elements can be subjects, foreground, background, and props. They can also be color, focus, and balance. I shot this image yesterday. The model is my daughter. This is the uncropped (though obviously resized) image. 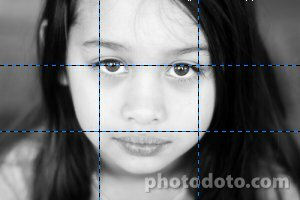 I’ve drawn the rule of thirds lines on the image. As you can see, the subject is centered. The photo isn’t bad but I think it can be improved with a little cropping. The two crops above take two different approaches. 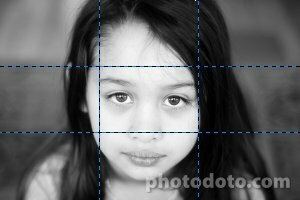 In the first, I’ve aligned the model’s eyes with the first horizontal line. The idea, since this is a portrait of a person, is to make eye contact with the viewer. Humans are genetically wired to respond strongly to eyes and faces. The second is a much more severe crop which attempts to align not only the top horizontal line but also both vertical lines. In my opinion, it definitely draws you into her eyes more. However, I think both of those crops (and the original) suffer from a lack of balance. In all three of the above images, the right side of the photo feels “heavier” to me. This is caused by the large patch of black hair on the right. When I look at this photo I feel slightly uncomfortable. Almost as if the image will fall over if it isn’t propped up by something. In addition, the bottom crop feels unbalanced vertically with her chin being cut off. This final crop addresses the balance problem. The hair is still there but I’ve shifted everything to the left and thankfully she has a complete chin again. The left eye is almost at the top left intersection. I cropped the image so that it was below the intersection to balance the image vertically. I think this is a much stronger crop than all of the others, including the original, and is the version I published. 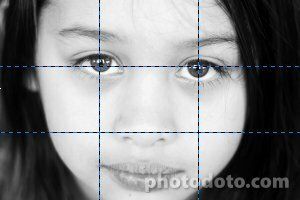 As you can see, the rule of thirds is a really just a guideline. And it isn’t something you’re supposed to follow blindly. Rather, it’s a distillation of wisdom regarding the placement of objects within your camera frame to achieve the strongest composition. I keep it in the back of my mind and use it as a helpful reference. 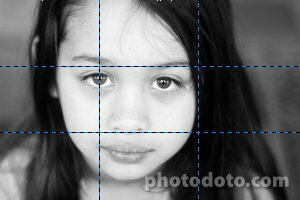 But I often crop images without consciously using it (or even better—compose in the camera with this in mind) and find that important elements of the image happen to fall on the rule of thirds lines and intersections anyway.